What is Minimum Travel Time? This is the time it would take to complete if you stayed on the bus through to completion and did not hop off. All passes can be completed in a shorter time by simply hopping off before the scheduled end point. We recommend hopping off as you travel to explore! Don’t forget- All passes have a maximum travel time of 365 days! This pass starts in Christchurch where you’ll hop on the world-renowned TranzAlpine train across the magnificent Southern Alps. 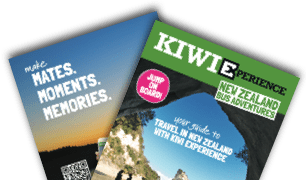 Upon arriving in Greymouth you’ll be picked up by Kiwi Experience and then it’s good times back to Christchurch, including Franz Josef and Queenstown. Our traditional hop-on-hop-off passes take you to the most epic ski fields in New Zealand. A Kiwi Experience but with snow package including Lift Passes and Shuttles to the action. Experience the very best of New Zealand with a South Island guided trip. Accommodation not included in these passes however we reserve accommodation for you at every overnight stop for the first night of your stay, with 2 nights in Queenstown. It's on its way to your inbox. You're almost there! Simply click on the link we sent you to confirm your email address. Then your e-book will be on its way. Want to learn more about NZ?